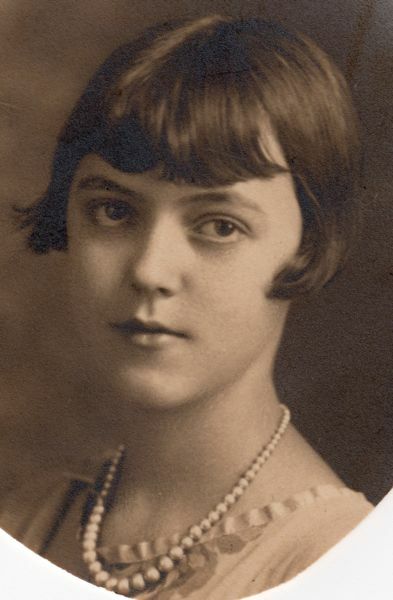 Welcome to the website that celebrates the life of Audrey Mae (née Spencer) MacDonald, an unknown woman artist of the 30s. This website, Glimpses of the Past: Morning Conversations with Audrey Mae, is the current version of a previously published book in 2004. Both book and website developed as a result of Heather MacDonald’s note taking of weekly conversations with her mother, Audrey Mae (née Spencer) MacDonald. Audrey was approaching her 90th birthday when Heather began this note taking that resulted in the previous book publication as well as this website. The time frame for the initial conversations with Audrey was from June 12th, 2002 through September 4th, 2004. On October 3rd, 2004, a gathering of friends and family was held at Alpine to celebrate the book publication of Glimpses of the Past: Morning Conversations with AudreyMae. The time frame for the Sequel to Glimpses of the Past:… was from September 11, 2004 until March 11, 2007 when Audrey just shy of 95 years died. Heather, who lives in California, is Audrey’s fifth child. Audrey lived her nearly 95 years in Rhode Island, never physically moving far from her ancestors homestead in the East Greenwich area. Heather depended on the phone conversations to keep the relationship current with her mother. The weekly dialogues were filled with (1) Audrey’s love of books, (2) her recollections of the neighborhood church’s programs in her early upbringing, (3) her interest in her ancestry, (4) her ability to recite from memory many classical pieces of literature and (5) numerous other events that confirm the highly intelligent and creative woman Audrey came to be. Through these conversations, Heather realized the pride her mother had in her Rhode Island Yankee ancestry. This sense of pride helped to sustain her throughout her life. However, equally important to this sense of pride was a sense of responsibility to impart this knowledge to future generations. Audrey wanted her children to know and to appreciate the strengths and struggles of the ancestors and how they lived and endured in colonial New England since the 1600s. Audrey is the link that connects the colonial horse and buggy days to the modern world. Without Audrey, our knowledge of the history of the every day life in colonial New England could have died out. Today, none of the descendents live the agrarian life. Over the 47 years that Heather would return home to visit her family in Rhode Island, her mother would often give Heather samples of (1) her artwork, (2) her writings, (3) maps of our historical cemeteries, (4) letters and documents in Olde English, etc. Much of Audrey’s writings included descriptions of our colonial ancestors and their life on the family homestead in East Greenwich, Rhode Island. She also gave to Heather the material that she created for the teaching environment. Memorabilia was very important to Audrey and she would ask Heather to keep these pieces safe for posterity. Heather was college educated by age 22 with a Bachelors Degree in Christian Education and a Liberal Arts curriculum. Audrey knew that Heather saw the value in all the research and unending hours of Audrey’s work on her family genealogy. Audrey’s dream was to have someone continue to disseminate this rich history. She would often give Heather, and other family members, old documents and other archival material. This and other websites carries on Audrey’s dream. Heather is indebted to her sister, Deardra MacDonald, a Temple University graduate and Audrey’s sixth child. Deardra instigated this website entry of Audrey’s work and she scanned in the entire publication of Glimpses of the Past: Morning Conversations with Audrey into this site, audreymaespencer.com. Deardra wanted to present this website as a commemoration of her mother, Audrey Mae (née Spencer) MacDonald, who was a woman before her times. Heather is also indebted to grand-nephew, Brian Blanchette, Jr., a student at the New England Institute of Technology, for introducing Heather to the advantages, disadvantages, possibilities, as well as the numerous steps needed in the setting up, of web pages. This website, as well as the previously published book by the same name, is the result of Audrey Mae (née Spencer) MacDonald’s endeavor and her desire to keep the Spencer, Vaughn, Matteson and Greene history alive for all future generations. The biography tab gives us a brief biography of Audrey Mae’s life. Also under the Conversations tab is the Dedication, Foreword, Afterword, Glossary, Footnotes and Appendix as well as the “Sequel to Glimpses of the Past: Morning Conversation with Audrey”. The Art Work tab includes numerous pieces of Audrey Mae’s art work as a child, a teenager, a RISD student and afterward. The Gift Shop consists of replicas of Audrey’s art work on note cards, stationery, place-mats, framed pieces and other creations for purchase through the family business, Audrey Mae Designs. Gift shop to be opened at a later date. Date not yet established. It’s the very-best individuals who have the perfect teaching and several interest.